Home/Pet Care Centre/Can Large Dogs live in Small Spaces? Can Large Dogs live in Small Spaces? Although us Aussies are well known for our wide-open spaces, the vast majority of Australians actually live in towns where the density of housing is increasing – which means more and more people living in apartments, townhouses and the like. For some who would love a dog, assume that living in a smaller home, apartment or townhouse means they have to choose a small dog. But that is not necessarily so – you could even say that whilst small dogs appear take up a smaller space, if they have a lot more energy, they can in fact use up a lot more space than you imagine! In fact, some big breeds can be just as content as little mutts who aren’t necessarily living a larger lifestyle, and you might be surprised how much downtime many of these bigger dogs take throughout the day. Many larger hounds are perfectly happy to lay about your house for hours on end. But most important is that you have enough space to give your dog a familiar space just for them. This may be their bed (or your couch!). They just need a familiar place to hang out and relax, and know where they belong. Having a dog restrained in a kennel, the laundry or a locked playpen for long duration will stress them out and could make them depressed – leading to behavioural problems. Remember happy, well adjusted dog means you’ll have less problems, and you’ll be a happy owner too! But whatever breed suits you and your lifestyle, and regardless of their size, it is most important that your dog gets adequate daily exercise to maintain a healthy body and to be stimulated and well socialised. This is important especially if your dog is alone all day in a house or apartment with little stimulation as lack of outdoor exercise as this can lead to both health and behavioural problems including obesity, barking or whining, and destructive chewing activities. Check out our dog breed centre for more information on breeds you may be interested in so you can see what they need to be happy and well adjusted, and what would work best for you and your family. 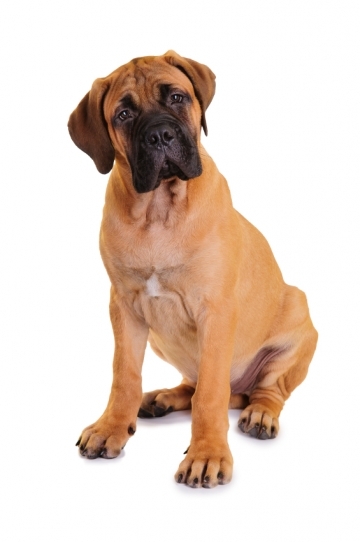 While there are many other variables when it comes to having a big dog in a smaller space, including consideration of cost (the amount of food they eat and vet’s fees), and the available space, it doesn’t have to limit your choice. Check out this infographic, “Apartment Living For Dog Lovers.” Not only does it address the best breeds for these tighter living spaces, it also gives important tips and tricks for a canine companion that will best suit your needs regardless of your living situation.